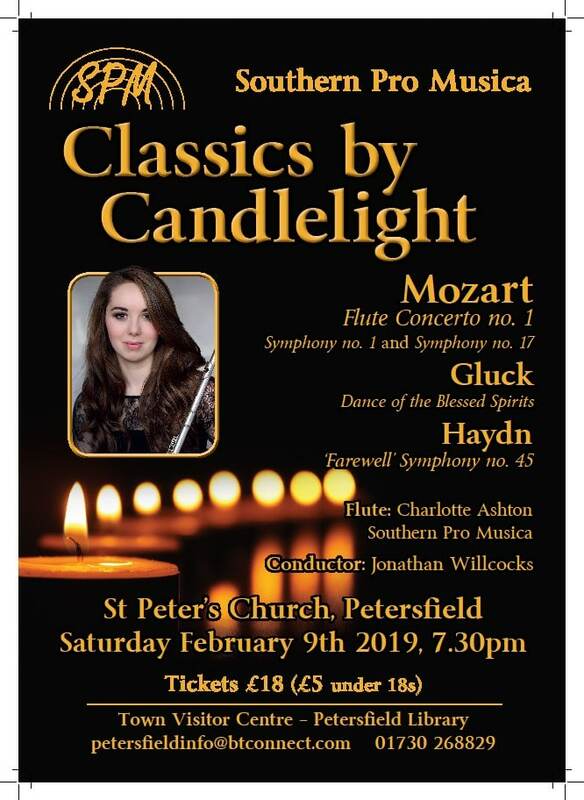 Following the great success of our previous Southern Pro Music candle-lit concerts in Petersfield, I am very pleased to tell you about ‘Classics by Candlelight’ on Saturday February 9th 2019 at 7.30pm in St. Peter’s Church, Petersfield – in the hopes that you may be tempted to come. We have as our soloist in Mozart – Flute Concerto no. 1 and Gluck’s beautiful Dance of the Blessed Spirits the outstanding young flautist Charlotte Ashton – who is currently principal flute in the BBC Scottish Symphony Orchestra. To frame those two works we have a pair of sparkling early symphonies by Mozart and the much-loved ‘Farewell’ Symphony by Haydn – so entitled because of the final movement where the orchestral players progressively leave the stage, leaving just two solitary violinists – Haydn’s irresistible message to his noble employer about the unsatisfactory working conditions and lack of holiday time that his players endured!